Doris Changeywo and Abraham Chebii claimed a Kenyan double in Sunday's Great Ireland Run in Dublin. 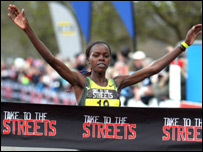 Changeywo was seven seconds ahead of Jo Pavey in the women's event while Chebii repeated his victory of 12 months ago. Chebii held off his former Kenyan team-mate Abdullah Ahmad Hassan, who now represents Qatar, by three seconds. Hungary's Aniko Kalovics was third in the women's race while Ukraine's Sergiy Lebid took third in the men's event ahead of top Briton Nick McCormick. Pavey was more than happy at recording a time of 32 minutes 22 seconds in the wintry conditions. Australia's Benita Johnson faded to seventh, a place ahead of her fellow Australian and last year's winner Victoria Mitchell. Britain's Kate Reed (32.50) was fourth while Maria McCambridge (35.13) was top Irishwoman in ninth, a place ahead of Sonia O'Sullivan (35.33). Pavey and 23-three-year-old Changeywo, fourth at last weekend's World Cross-Country Championships, broke away from the field after the halfway stage. "Doris was obviously in good shape given her position at the World Cross Country and it showed when she just pulled away from me on the steepest part of the course," said Pavey. Chebii clocked a time of 28 minutes and 48 seconds to win the men's race. "He made me fight all of the way before I put in a sprint in the last 300 metres," said Chebii of his rival, formerly known as Albert Chepkurui but who has represented Qatar for the last five years. Lebid put up a strong performance to finish just eight seconds behind Hassan while McCormick clocked a respectable time of 29 minutes and 18 seconds.